With its rock-solid soundtrack, extremely unique take on the heist genre and balls-out car chase action, "Baby Driver" is one of those films you might easily dismiss but really shouldn't. It is one of the most original and exciting films we have seen in quite a while and delivers an experience few films rarely offer. 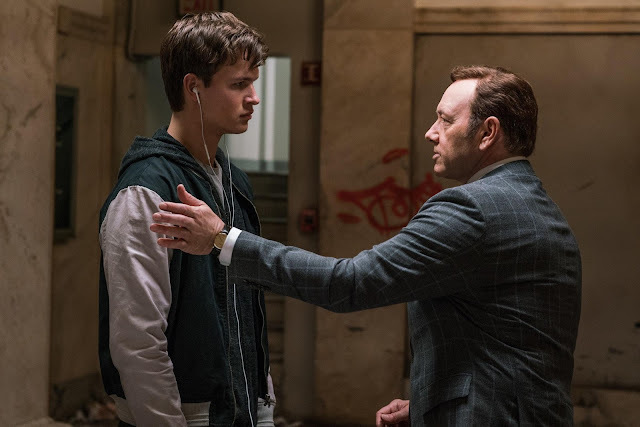 Baby (Ansel Elgort) is a talented, young getaway driver who is forced into the seedy world of bank robbers as he needs to pay off a huge debt from Doc (Kevin Spacey), the brains and mastermind of the crew. Things are looking to turn itself around as Baby is able to call it even with Doc, quits from the game, meets the girl of his dreams with Debora (Lily James). But Doc has other plans with his most valuable asset. Forced into another heist, he must face the music when things turn for the worse during the heist and threaten his life, love, and freedom. Oh boy, "Baby Driver" definitely left a mark with us. Where to start with "Baby Driver"? The soundtrack alone is worth the entry price. It easily rivals "Guardians of the Galaxy" and is not only killer but also essential and in sync with what's happening on-screen. Car chases, fights, gun shots, dances, you name it. It easily jives and outdoes its visual brother. But sounds alone do not make a great experience. "Baby Driver" also delivers on cinematography. The film is stylistic, colorful and scenes are crisp and clean that they even found a way to make a laundromat look interesting. Action-lovers would definitely rave about the car chases. They are awesome, in-your-face, over-the-top but most importantly grounded. Unlike a "Fast and Furious" film, "Baby Driver" never felt unrealistic or crazy impossible with its execution. Story-wise, the film delivers more-or-less a straight forward experience with huge twists and turns in its latter portions. Most of these surprises work but the ending was a bit of a letdown and a huge logic bender in our books. Overall, "Baby Driver" never relents. From the first scene to the last one, it will hook you in. If not for the stylish visuals, the soundtrack will. It's a well-rounded experience that has thrills, spills, turns, and laughs along the way.